While writing by the seat of your pants is generally accepted as a viable method for writers, few people can actually verbalize why outlining just doesn't work for some of us. Sure, we discovery writers often complain that we lose our creative juices when forced to work with an outline, but that is a vague and unsatisfactory explanation at best. 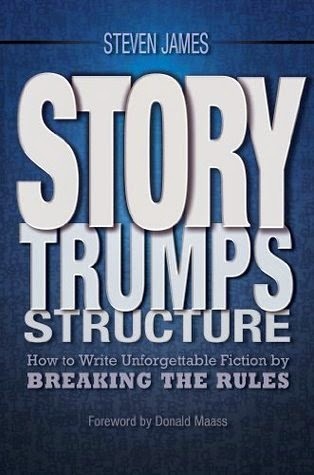 Story Trumps Structure by Steven James offers a better, more precise explanation, and I highly recommend it to others who want to try discovery writing. 1. Events seem forced because I am following some pre-determined plot points rather than taking my cues from the details of my character, settings, and situation. What I thought would be logical in the pre-planning stage might not actually be so when I flesh out the world in my draft. 2. Transitions between scenes can turn out weak because instead of writing what follows logically from the previous scene, I'm writing what I dictated in the outline. 3. Narrative weight of subplots is hard to predict until I flesh out the scenes. It's hard to tell whether a scene will take one page to write or ten pages. 4. This leads to problems with fulfilling reader expectations. The more weight or time you spend on an aspect of your novel, the more readers expect that it will payoff in a meaningful way later. However, at the outlining stage, you're unable to predict what will become important as you write it and to outline the correct payoff. 5. The climax may either feel as if it came from nowhere (because it didn't follow logically from what we know about the character/setting/situation) or it might feel predictable (because it takes time to come up with a truly unexpected yet believable ending and our outlining stage is often much shorter than the writing stage). Not that discovery writing doesn't have its own pitfalls, such as falling into a rabbit hole you can't navigate your way out of.